and a strong advocate for public education. 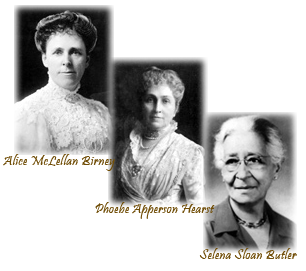 PTA’s founders Phoebe Apperson Hearst and Alice McLellan Birney, and the founder of Georgia’s Congress of Colored Parents and Teachers, Selena Sloan Butler, were women of imagination and courage. They understood the power of individual action, worked beyond the accepted barriers of their day, and took action to literally change the world. They had a simple idea—to improve the lives and futures of all of our children. As much as other conditions in America may have changed, that idea has not. PTAs keep it alive. Today, PTA is the largest volunteer child advocacy organization in the nation. Our members represent the ethnic diversity of our nation, and they come from the ranks of traditional families, single-parent households, blended families, grandparents, and other caring adults. Together, we continue to serve as the conscience of the country for children and youth.